David Hockney (b. 1937), Great Pyramid at Giza with Broken Head from Thebes. Oil on canvas, 72 x 72in. (183 x 183cm.) Painted in 1963. Estimate: £2,500,000-3,500,000. Photo: Christie's Images Ltd 2013. LONDON.- In February 2013 Christies Post-War & Contemporary Art department will offer for sale Great Pyramid at Giza with Broken Head from Thebes (1963). A unique, landmark painting, it stands as the only canvas to commemorate David Hockneys first trip to Egypt at the age of 26. Commissioned by art critic David Sylvester and journalist Mark Boxer at the Sunday Times, the trip came shortly after the artists graduation from the Royal College of Art. It marks a watershed in his practice in terms of style, scale and composition. Forming part of an important British collection for more than forty years, this is the first time that this painting has ever been seen at auction (Estimate: £2,500,000-3,500,000). Egypt is one of the most thrilling countries Ive ever been to in the sense that these monuments are the oldest known buildings anywhere. After all, when Cleopatra showed Julius Caesar the pyramids, they were already two thousand years old and more. It is quite awe-inspiring; not even in China are there things older, and I think you feel connected with them, whoever you are David Hockney, 1993 (D. Hockney, N. Stangos (ed. ), Thats the Way I See it: David Hockney, London 1993, p. 36). Great Pyramid at Giza with Broken Head from Thebes follows on from Hockneys well-documented obsession with Egypt developed through his encounter with the ancient Egyptian art he encountered at the British Museum and later at the Pergamon Museum, Berlin, as well as his deep admiration for the poetry of Greek Alexandrian poet Constantine P. Cavafy. This was also a time of popular fascination with Egyptiana, culminating in Elizabeth Taylors leading role as Cleopatra in 1963. 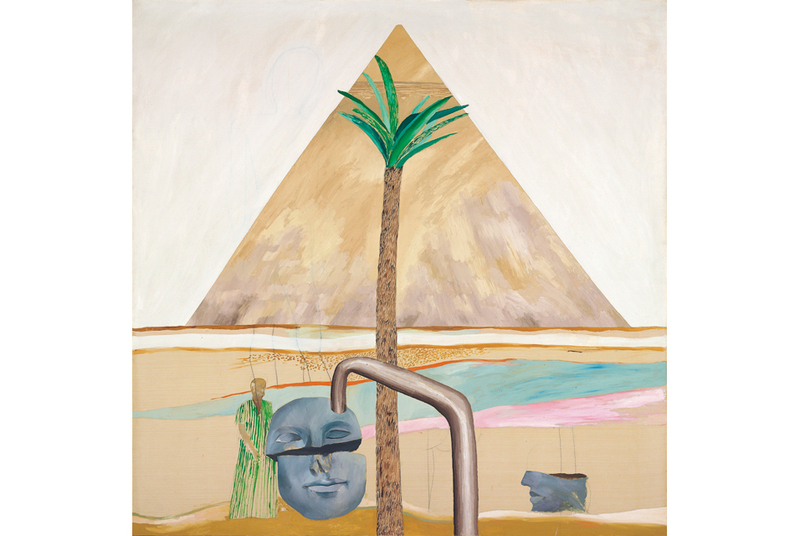 The Egyptian inspiration first began to appear in Hockneys work as early as 1961 (with A Grand Procession of Dignitaries in semi-Egyptian style), and his trip in 1963 sponsored by the Sunday Times and David Sylvester was the fulfilment of a long-held dream. Whilst in Egypt, Hockney undertook some forty works on paper*, but no canvases. This painting is the only surviving work to have been completed upon his return to Britain, standing as the most important monument to his trip. First exhibited at the Kasmin Gallery in London in 1963, other major works from this inaugural solo show are now housed in the Museum of Modern Art, New York, Astrup Fearnley Museum of Modern Art, Oslo, Hamburg Kunsthalle, Hamburg, Museum Calouste Gulbekian and the British Council collection. It was with the proceeds of this highly successful, inaugural solo-exhibition that Hockney made his first trip to California in 1964. Since it was first exhibited in 1963, Great Pyramid at Giza with Broken Head from Thebes has formed part of major shows including the Calouste Gulbekian exhibition of important post-War artists such as Roy Lichtenstein, Francis Bacon and Jasper Johns held at the Tate Gallery, London in 1964, Hockneys major retrospective at the Whitechapel Art Gallery, London in 1970 and in Paris, Musée des Arts Décoratifs, Palais du Louvre in 1974. *One of those drawings, View from Nile Hilton, was sold for £342,400 (estimate: £8,000-10,000) at Christie's London on 8 February 2001.